THIS LISTING IS FOR THE 250G REFILL TUB. THIS IS A COMPLETELY NATURAL AND BIODEGRADABLE WASHING UP LIQUID. 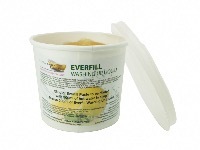 IT IS A GREAT OPTION FOR BOTH SQUEAKY CLEAN DISHES AND FOR THE ENVIRONMENT AS ITS A WASTE FREE, NATURAL ALTERNATIVE. THIS LISTING IS FOR THE EMPTY 500ML GLASS BOTTLE AND THE 250G REFILL TUB.